Destroyer is throwing a curve ball to anyone who expected so see a slick set of city-locked visuals in a video for the Vancouver songwriter's Poison Season single "Times Square." 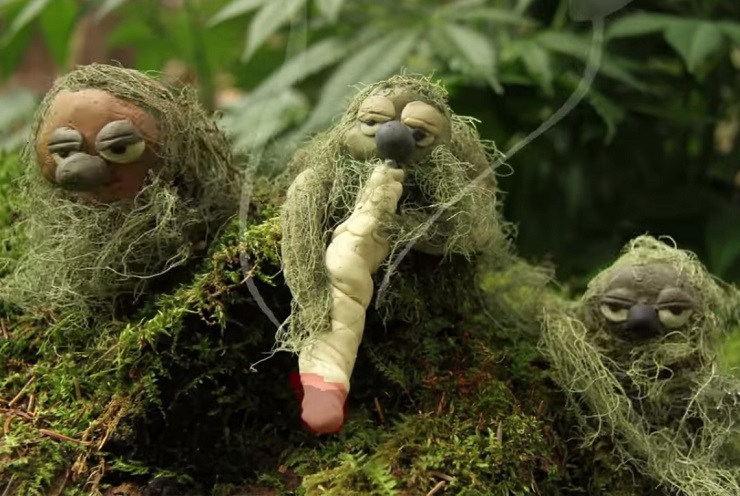 Instead, he's living it up with the moss men in a charming stop motion clip. Did you think that was a saxophone blasting throughout the track? Well, you were wrong, as it's apparently the sound of a giant joint being honked on by a tiny woodland creature, one of many that slips through the video's lush forest setting. Elsewhere, you'll see a severed Hulk hand suffering stigmata, a buck-toothed wood chip taking a taste of a magic mushroom, and a self-replicating brainiac. Dan Bejar gets in the mix too, as presented in various close-ups. But, you know, he's not the only one rifling off poetics. "You can follow a rose wherever it grows," an anthropomorphic sign sings at one point, opting to give us esoteric advice rather than a direct route home. You can see Shayne Ehman fantastic animated video down below. Poison Season officially starts tomorrow (August 28), with Destroyer's album of the same name hitting stores through Merge Records/Dead Oceans.